It is often proclaimed that housing in Australia today is unaffordable and expensive. Affordability is an important factor in the property market, as it can prevent future growth, or help prices appreciate, depending on the percentage of household income going towards mortgages or rents. Affordability can be influenced by a mix of variables, such as interest rates, median prices and median incomes in a given area. If people are spending a large portion of their income on mortgages, through high interest rates or high property prices, they are more sensitive to rate rises and the tightening of the lending market. Affordability can therefore be relative and have different effects on different markets. This is currently evident in the heated markets of Sydney and Melbourne as they begin to cool, whilst the affordable markets, where less household income is required for mortgage repayments, have not been as affected by new lending policies. Some analysts report on affordability as the relationship between incomes and median house prices. 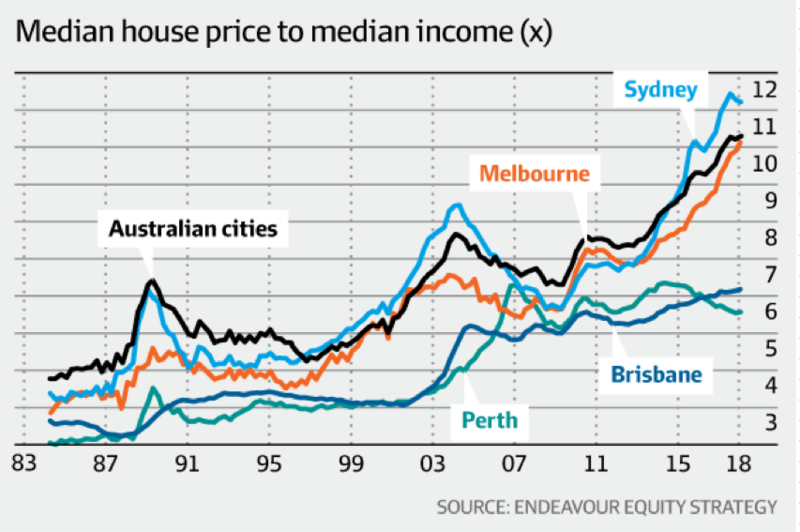 For example, Sydney’s house prices are now twelve times median incomes. This is a useful tool to compare the expense of different markets, however, there is a variable not being used in this equation; interest rates. It is interesting to see what effect the cost of money has on the debt ratio of a household, or the proportion of family income needed to meet loan repayments. As a general rule a market is considered affordable with a debt ratio of 30% or below, i.e. 30% of household income is going towards mortgages. 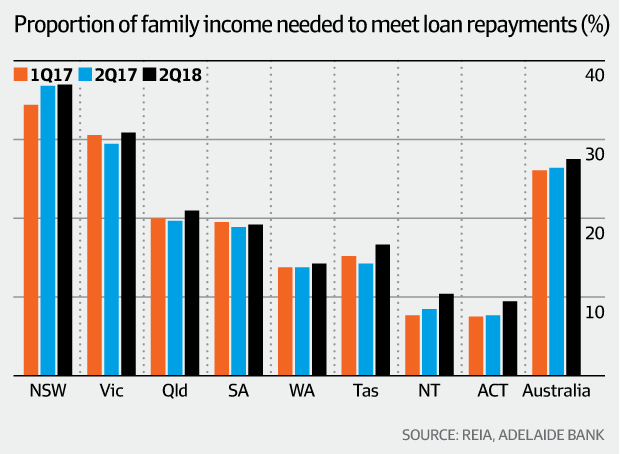 In the major markets of Sydney and Melbourne the mortgage repayments now account for over 30% of incomes. With the proportion of incomes required in NSW to meet loan repayments approaching 40% (Fig. 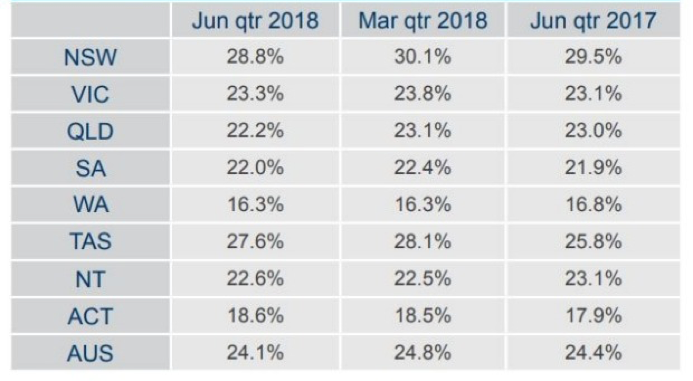 2) and only 28.8% for rent payments (Fig. 3), it now appears more attractive to rent than buy in this market. Many traditional first home buyers in Sydney are now looking at the alternative strategy of ‘rentvesting’, or living where they want to live, and buying where they can afford. Others who already own their home are looking to invest in the markets showing affordability for future price growth. Another group again are looking at the similar incomes they could be achieving within areas with significantly cheaper housing and relocating to these more affordable areas. Population trends are supporting this migration to affordability, and property prices are set to follow. 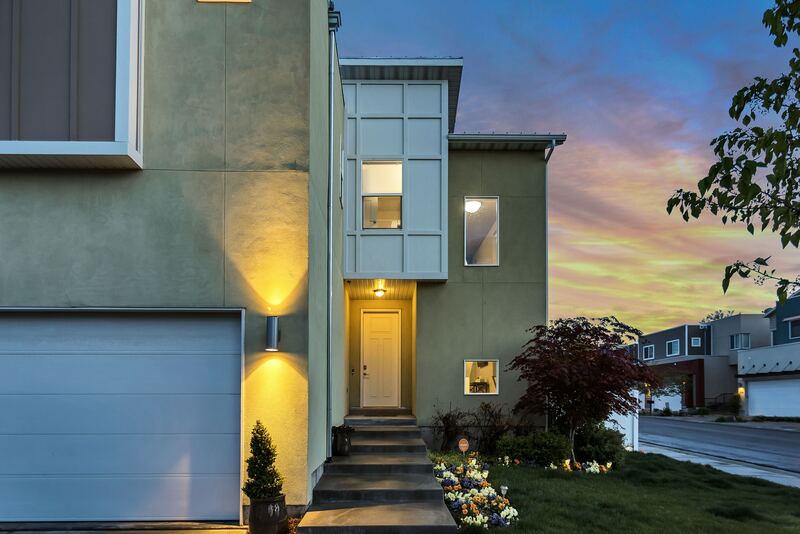 All of these groups highlight the importance of affordability as part of a holistic research model for property investors and the demand it can create on a market. 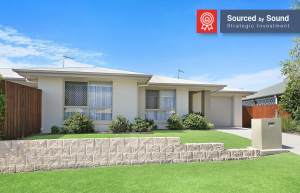 Sound Property’s approach identifies 15 Key Investment Drivers for growth and rental yield and are published in our complimentary Suburb Profile Reports.